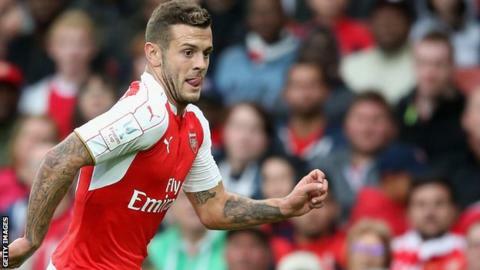 Arsenal midfielder Jack Wilshere is unlikely to be fit for England's European Championship qualifiers next month, says Gunners boss Arsene Wenger. Wilshere, 23, is back in training after suffering a hairline fracture to his right ankle on 1 August. "It is too early to think he would be playing for England, but after the international break he has a chance," said Wenger. England visit San Marino on 5 September and host Switzerland three days later. Wenger said he will not make new signings for the sake of it, and there were no incoming transfers on the horizon. "I expect signings like you, but at the moment we are not close," the Frenchman said at a press conference before Monday night's home Premier League match with Liverpool. "We want to develop players as well rather than overthinking whether to buy. "I am not against buying when it is a plus for your team. If it is just to buy a player at the level of the players that you have to make people happy, I am not ready for that."